Jim “Texas Shorty” Chancellor ​ ​ ​p​lays the fiddle and a variety of instruments in all genres of music, but is most recognized for his long time success in the style of Texas Old Time Fiddling. 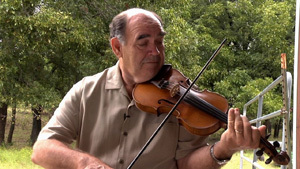 Jim has won or placed in virtually every major fiddle competition in the United States, and has held the title of Texas State Fiddle Champion, Inductee into the Texas State Fiddler’s Hall of Fame, World Champion Fiddler, and the coveted Grand Master’s in Nashville, Tennessee. He has made numerous recordings, appearing with such greats as Sam Bush, John Hartford and Mark O’Connor.